The range of VAICOM PRO key features is summarized in below tables. The FREE version is fully functional and can be used with DCS immediately. FREE edition supports a specific range of DCS modules and access to a baseline set of selectable options. 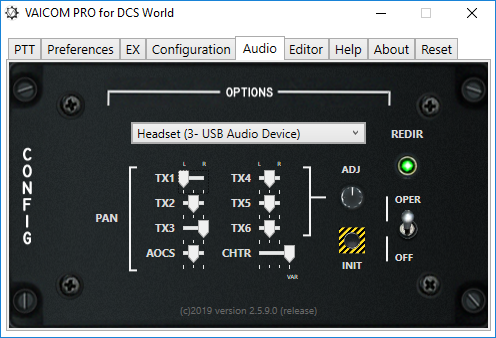 After purchasing a license key for PRO edition, support for all DCS modules is unlocked as well as access to the complete range of user-selectable options. The User Manual PDF provides detailed descriptions on the various functions and how to use them. As a new and unique PRO feature, VAICOM PRO allows the redirecting of comms audio to a separate audio device for output. For example this can be used for split comms output to a headset while playing DCS ambient sounds on room speakers at the same time. Also default audio device can be used with the added option to apply L/M/R panning to the individual radios. This exciting plugin feature opens a whole new range of deeply immersive possibilities for DCS World. "A Stellar Application. Worth every cent."